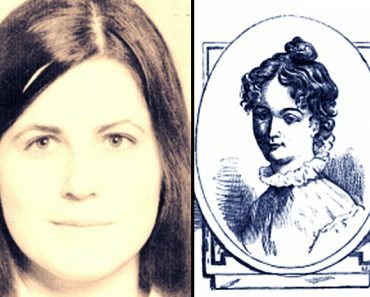 The true story of The Greenbrier Ghost is an incredible, court documented case in which the victim, Elva Zona Hester Shue, returned in spirit and testified to her own death and named her murderer. 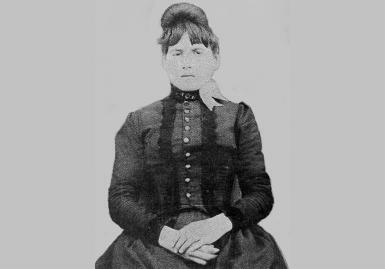 In January of 1897, Mary Jane Heaster buried her 23 year old daughter, Elva Zona Heaster Shue, in a cemetery near Greenbrier, West Virginia. The coroner listed the cause of Zona’s death as ‘complications from childbirth,” which was absolutely bizarre since Zona wasn’t pregnant! Mary Jane didn’t buy it and was certain that something awful had happened to her daughter. At the very least, Mary Jane refused to believe that Zona’s death was anything but un-natural. In 1896, Zona met a man by the name of Erasmus Stribbling Trout Shue. He had just moved to Greenbrier and hoped to create a living for himself as a blacksmith. When Edward, as he was called, met Zona, they liked each other at once and soon started a serious courtship. Mary Jane, on the other hand, did not like Edward at all. For whatever reason, she didn’t trust him and ‘felt’ that there was something quite evil about the man. Despite the wishes of her mother, Zona married Edward on October 26th of 1896. Three months later, on January 23, 1897, Edward sent 11-year-old Andy Jones over to his house to ask his wife, Zona, if she needed anything from the market. When the boy arrived at the house, he found Zona dead on the floor. He ran straight home and told his mother. The local physician and coroner, Dr. George W. Knapp, was summoned. It took him better than an hour to arrive at the Shue residence. Inside that hour, Edward had taken it upon himself to carry Zona’s dead body to an upper bedroom and dress her up in her Sunday best. He had put her in a beautiful dress with a high neck and a starch stiffened collar. He had also covered her face with a veil. When Dr. Knapp tried to examine the body, to determine what had caused her death, it was not an easy process. In fact it was a rather difficult task at best, as Edward was inconsolable, crying hysterically and cradling Zona’s head tightly in his arms throughout the entire examination. The doctor did notice a slight discoloration on the side of Zona’s cheek and neck but when he tried to examine them closer, Edward lost his mind. He cried out all the more in his overwhelming grief. Mary Jane knew that her daughter was not pregnant and was becoming very suspicious about her daughter’s untimely and un-explainable death. She was now casting that suspicious eye on Edward. And her suspicions only deepened at Zona’s wake. Edward was acting strangely. One moment he seemed grief stricken and the next he would appear agitated and nervous. He had placed a pillow on one side of Zona’s head and a rolled up cloth on the other. Her neck was covered by a large scarf, that Edward claimed had been her favorite, and he wanted her buried in it. He refused to allow anyone to get too close to the casket. People attending the wake also recognized Edward’s strange behaviors. They also noticed an odd looseness of Zona’s head, as the casket was being prepared for burial. No one said anything about theses oddities and Zona was buried. Despite all of the ‘strangeness’ surrounding her daughter’s death, Mary Jane Heaster, in reality, had no proof of foul play and if there were any answers to her many questions, they had seemingly been buried with Zona. Mary Jane had taken the rolled up white sheet from Zona’s coffin before it was sealed. And now, days after the funeral, she tried to return it to Edward. He refused to have it. Mary Jane decided to keep it for herself, in memory of her daughter. She did noticed however, that it had a strange odor. So she submerged the sheet in a basin of water, with the intent to wash it. And, as she did so, the water turned red, the color bleeding from the sheet. Mary Jane was flabbergasted. She took a pitcher and scooped some of the water from the basin. It was clear. Mary Jane saw this as a sign from Zona. Over the next few weeks, Mary Jane prayed that Zona would come back from the grave and reveal what had truly happened to her. Each evening, as dusk fell, Mary Jane would light her oil lamps and candles and stoke the fire. It was during this hour of the evening, that Mary Jane claimed, the spirit of Zona came to her on four nights. And it was during these visits, that her daughter revealed exactly how she had died. Zona told her mother that Edward was cruel and abusive toward her. She said that on the day she died, Edward became violently angry when she told him she had no meat for his dinner. He was overcome with rage and savagely attacked her, breaking her neck. To prove her account, the ghost slowly turned its head completely around at the neck. Without reservation, Mary Jane went straight to John Alfred Preston, the local prosecutor. She told him what she had seen in Edward’s strange behaviors at the time of her daughter’s death. About the way he attempted to protect his dead wife’s neck from movement and inspection. The way he had dressed her up in a high collared gown. And the strange event with the sheet that had laid next to Zona’s head in the casket. And she told him about Zona’s spirit telling her everything Edward had done, including breaking her neck. John Preston listened patiently to Mary Jane’s ghost story. He was certainly skeptical, but there was enough about her story that did cast some unusual and suspicious concerns on the case. He decided to pursue it. Just as the ghost had revealed the facts of her death to her mother, so did the autopsy reveal those same facts to the prosecutor. Zona’s neck was broken and her windpipe crushed from violent strangulation. Edward Shue was arrested and charged with Zona’s murder. While awaiting trial, Edward’s past came into the light. Seems Edward had served time in jail for stealing a horse. He had also been married twice before, each marriage ending due to his violent temper. His first wife divorced him after he had angrily thrown all of her possessions out of their house. His second wife died from a blow to the head. None of it surprised Mary Jane. In fact, all it did was confirm her opinion of the man. Once again, Mary Jane’s intuition about Edward was confirmed. He was truly evil and she had known it all along. While in jail, waiting for his day in court, in-mates and guards reported that Edward was in good spirits. He spent his time bragging about his intention to eventually have seven wives. Being only 35 years old, he said he should easily attain that goal. He was certain that he would not be convicted of Zona’s death because no evidence existed to support the prosecutions claim. But Edward was wrong. He underestimated the testimony of a ghostly eyewitness to the murder. 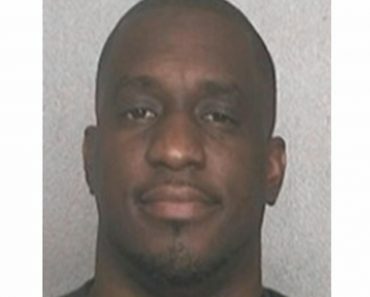 In June, Edward’s trial for murder came before a jury. The prosecutor lined up several people to testify against Edward, citing his peculiar behavior and his unguarded comments. But the truth was that there really were no witnesses to the crime and Edward had not been placed at, or near, the crime scene at the time that the murder allegedly took place. The court had ruled that prosecuting testimony about the ghost, and what it claimed, was inadmissible. The prosecution had little to do battle with. Taking the stand in his defense, Edward adamantly denied the charges. And it looked like he was going to get away with murder! Then Edward’s defending lawyer made a drastic mistake. He called Mary Jane Heaster to the witness stand. Presumably the defense intended to show that Mary Jane was unbalanced or even insane and, at the very least, had a great personal prejudicial against his client. Then he brought up the little matter of Zona’s ghost and her from- beyond-the-grave visits. Ghost story or not, the jury bit and passed down a verdict of guilty on the charge of murder. Edward was given life without parole. 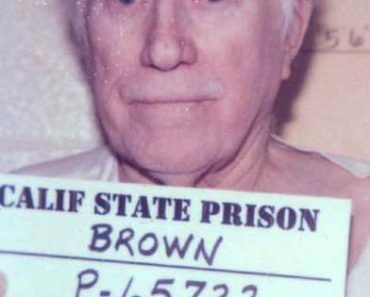 Normally such a conviction would have brought a sentence of death, but because of the circumstantial nature of the evidence, that being the testimony of a ghost, Edward was sentenced to life in prison. He died on March 13, 1900 in the Moundsville, W.V. penitentiary. 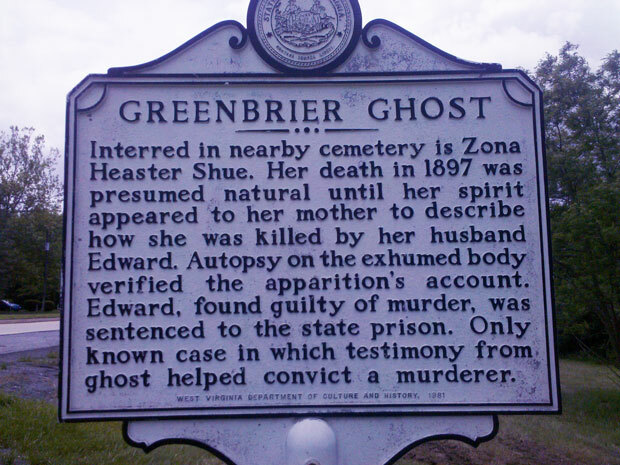 A highway, historical marker near Greenbrier commemorates Zona, the Greebrier Ghost, and the unusual court case surrounding her death.